Ideas for who to send on this were scattered, so I went with Harvar so we actually have a chance of succeeding(and someone did suggest him ). Sarotar may have been a decent second choice, but Very Good combat isn't even in the same league as Heroic combat for a quest that involves a lot of killing things and being killed. 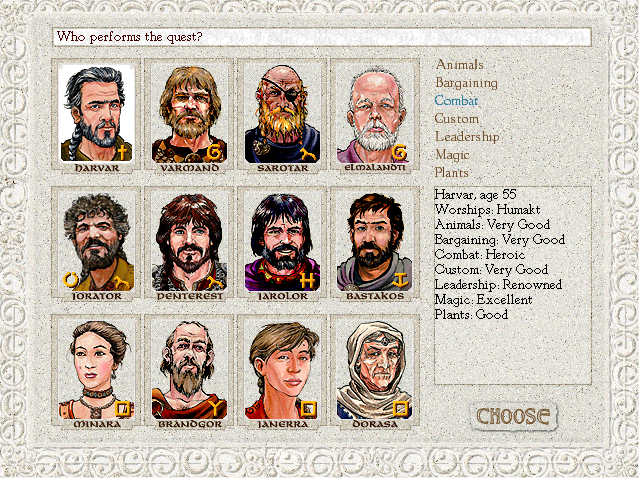 But there's still time to pick someone else(and now with a convenient ranking of nobles' combat skills, to boot), because we still have to decide on a goal for this quest! Although if you guys don't pick someone else, I'm sticking with Harvar.